With experience as a designer and researcher, I have conducted and led a breadth of projects for clients - from personas to experience maps, lean user research to task analysis and wireframing. A comprehensive examination of the merchant onboarding process for an e-commerce company, used to understand the process and discover opportunities for a self-serve product. Tool: Gliffy.com. I have created personas across multiple industries, from games to online education and small businesses. I incorporate the Jobs-to-be-Done method into my personas, focusing on motivations behind the desire to "hire" a product. I typically work with a visual designer to create artifacts to share personas across the organization or company. Persona created for an e-commerce company, showing important motivations and key behaviors for a small business owner. A persona for a type of forum user on an education website. 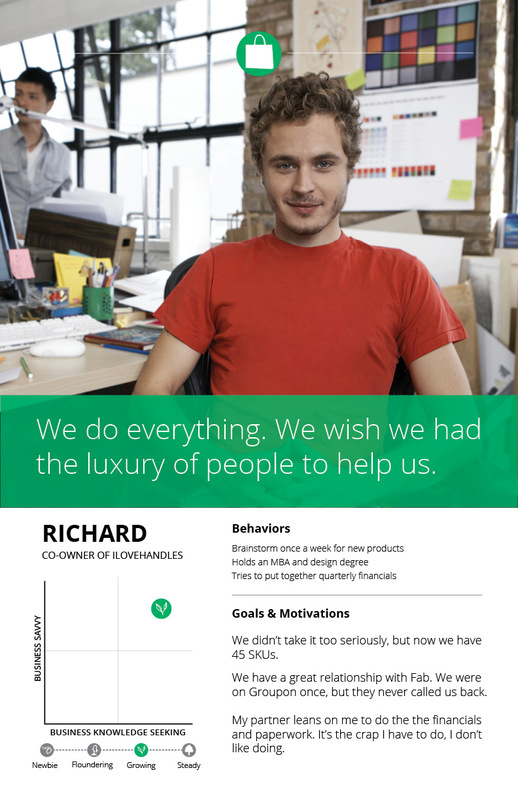 This persona highlights key behaviors, opportunities, and conveys his story to grow empathy within the company. Experience maps offer a look at what people are thinking, feeling, and doing throughout an engagement with a product or service. Research for an experience map includes task analysis, interviews, and observations (in-field, remote, or in lab). Once the experience map is created, we can use it to drive innovation, looking for places where the emotional experience suffers or where design can help the customer accomplish their goals faster. I learned how to create experience maps from Adaptive Path during a workshop they hosted in San Francisco. After conducting interviews to learn about the process of buying a new computer for design graduate school, we organized our notes by steps in line with behaviors, thoughts, and feelings. We used green and red to show emotion, with the stages laid out in a circle because the process of purchasing a new computer is iterative. This map lets us see where we can design cross-touchpoint features or services to make the shopping experience better. Flows and wireframes are great tools for clearly articulating a product or service path. I use them to help engineering and design teams see the whole picture before getting started on hi-def designs and code. 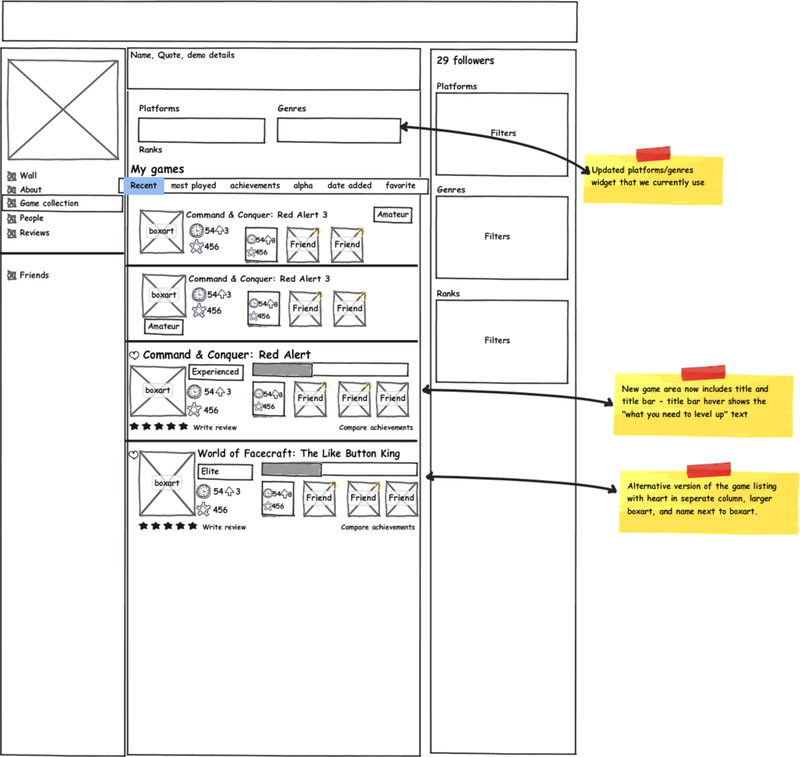 We can use wireframes for user research, testing copy, mental models, and task success. Simple online website editors such as Strikingly or Squarespace can be useful to build working website or application prototypes. 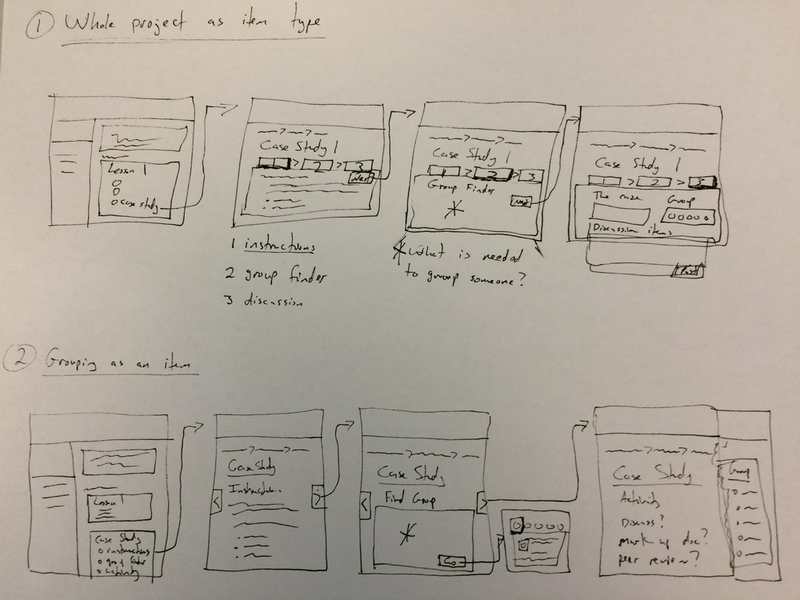 A sketch of the flow helps the team gain a shared understanding of the process. In this case, we were looking at the process of being grouped for a team assignment. This wireframe was used for working with the visual designer to build a gamer social network from the ground up. A structured flow acts as a guide for designers building wireframes and for the engineering team to start developing the structure for front and back end. I used Strikingly to create a working prototype of a course for an online education company to help them think about different ways to show their content. Click the image to see the live demo. A story is a powerful design tool. It can be conveyed in a presentation, with a storyboard and an emotionally connected presenter, or it can be conveyed in video, such as a documentary or tale of the future. I have introduced several of these techniques to companies I've worked with, building empathy or inspiring a team with a vision of the future. This is a sample of the type of footage we can capture during the filming of a merchant documentary. The goal is to build empathy through storytelling and drive discovery through analysis. Special thanks to Christopher Denise @ Reel Eagle Studios for filming and editing this piece. I worked with designer Myra Liu to storyboard a vision of a future learning experience. She did the art for this project. Another of Myra's drawings for this project. We used wireframes and images like this to get cross-functional buy-in for a large design change. Knowing what metrics you are trying to move ahead of time can help frame research questions and guide the design process. I focus on specific, measurable outcomes for each design project. I use the HEART Metrics framework (happiness, engagement, adoption, retention, and task success) developed by Kerry Rodden at Google. Typically a project will focus on no more than two areas. For example, a new onboarding design for an online education company might focus on adoption and task success - can new users find a relevant course and do they start the course?